The easiest, gourmet campervan lunch or supper you’ll ever buy, right on our doorstep! Home > Blog > The easiest, gourmet campervan lunch or supper you’ll ever buy…right on our doorstep! The easiest, gourmet campervan lunch or supper you’ll ever buy…right on our doorstep! Sally Brown has just arrived from the UK to join the FMH Team as Customer Services Administrator, and she has already been busy unearthing local gems for our hire clients, including a fantastic “real-food” lunch or supper take-away! A take away that sells homemade boeuf bourguignon and tart tatin, the easiest, gourmet campervan lunch or supper you’ll ever buy! Last Saturday lunchtime, whilst exploring my new local area, I got a bit lost and ended up in Sens with a two-hour wait for the Tourist Information Office to open, and I was desperate for the loo! Tourist information offices always have toilets, so it had been an obvious target, but I overlooked the fact that everything shuts for a couple hours for lunch in France and the Office de Tourisme was no exception. 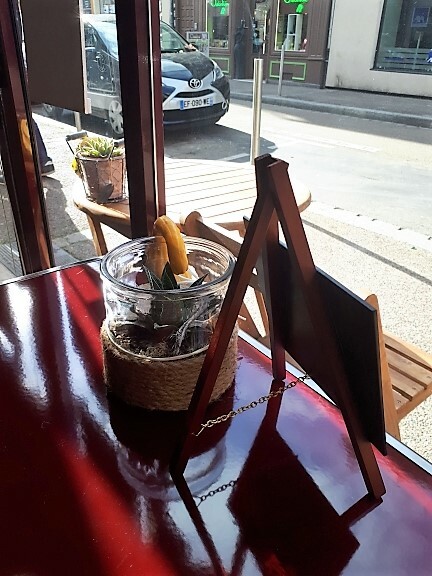 Realising that only restaurants would be open now, I started to look for a little café that was just right to try and grab a coffee, maybe something to eat and, hopefully, use the facilities at the same time. You know the sort, not too close to the expensive and often overrated tourist area, not near the rougher looking Greasy Joe type diners, not too busy so I’m rushed and not too empty so there’s the disturbing sound of tumble weed blowing through as I walk in the door. Not that I’m fussy but, like Goldilocks, it had to be just right. I ended up walking down from the Tourist Information office, past the Cathedral and carrying on along the rue de la République. About halfway down, next to a fabulous little sewing and material shop on my left, I saw a blackboard next to an old-fashioned bike with a refrigerator box on the front. I had found “Mamie Lou’s”. Homemade food made with regional ingredients and produce at Mamie Lou’s – delivered by bicycle! I went in and found a space with just three tables in the front and what looked like a sparsely filled refrigerator towards the back. By now I was absolutely desperate, so I walked past a door with an encouraging toilet symbol on it and found, waiting at the back of the café behind a serving desk, a young man. This quaint little place offers the best and most attentive service in a café or restaurant you can imagine. 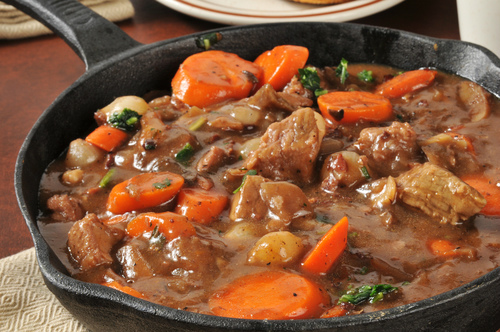 And if the usual dose of takeaways – pizzas, Chinese etc just doesn’t float your boat – this secret treasure will serve you up the most magnificent boeuf bourguignon takeaway you have ever tasted! 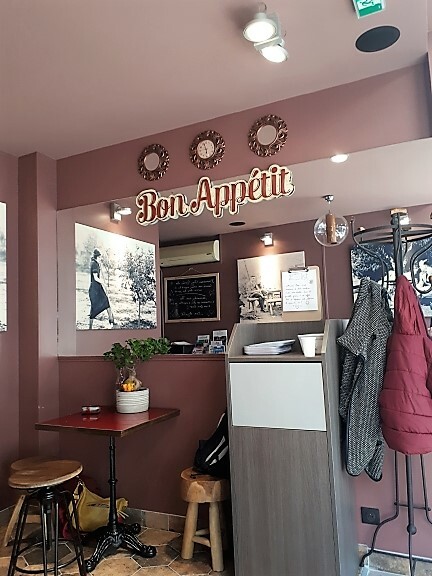 Parisian chef Otis, and his wife, moved to Sens in June this year and decided to set up a café/restaurant just how they like it: a surprisingly wide choice of vegan, vegetarian and meat dishes at prices to suit all pockets. The meals are cooked on site and prepared ready to takeaway, or can be personally delivered by Otis on his trusted bike – very handy if you are staying in Sens in a motorhome. If you would like to sit a while and enjoy your meal in situ, Otis will gladly show you how to use the microwave and you can warm it up there and then to sit at the window table and watch the world go by. Or, if he’s not too busy, chat a while with Otis and practise your French. Otis and his wife pride themselves on sourcing the very best ingredients, and I must say you can tell the quality in the meals with beef that quite simply melts in your mouth. If they can, they use ingredients from local farmers that are ‘bio’ (organic), but where that’s not possible, just ask Otis and he can tell you the name of the farmer that he has bought the ingredients from – not something that your local pizzeria could do, I’m sure. And just as a side note, Mamie Lou’s was immaculately clean throughout, including the loo! I strongly recommend a visit, and tell Otis, Sally says “Hi!”. Sally is France Motorhome Hire's Operations Supervisor and works at our base, just south of Paris. France Motorhome Hire provides immaculate, reliable and carefully maintained motorhomes and campervans for English-speaking visitors wishing to explore France and the rest of Europe.